Anthony Patch did an outstanding job at the Hear the Watchmen Conference in Knoxville, detailing the concept of Plasma Physics and the connection between CERN and the D-WAVE Quantum Computers. Maybe he came too close to the plans of the Elite. His presentation mysteriously disappeared from the conference system after he finished. He had to redo his presentation on Sunday to get it on film. There were also reports of a black military helicopter circling around the area of the hotel during the second time of presenting his materials! I am grateful to Mike Kerr and the great folks at Hear the Watchmen for releasing this timely presentation. If you enjoyed this presentation, I encourage you to pick up Anthony’s new book that he co-authored with Josh Peck, Gonzo Shimura, and S. Douglas Woodward. Use the link below to purchase on Amazon. 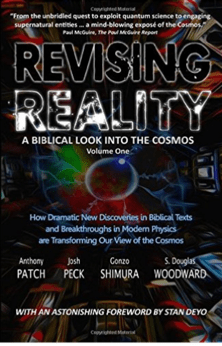 Revising Reality: A Biblical Look into the Cosmos – Volume 1.
excellent info, thanks Anthony i was not easy getting this info out. Thank you for posting this Anthony Patch’s vital talk connecting CERN and D Wave computer and many of the implications for us at this time. Noticed it kept disappearing! prophecy concerning beast system and how it works today. So glad you and Mr. Patch are in fellowship. What a dynamite combination! When I open my MacBook and look at the lid I see illumination through and apple, an apple with a bite out of it. When I close the lid there’s a white light on the front edge that pulses on and off. A pulse would indicate a heart beat. My Motorola Droid has a little green light that also pulses on and off at times. When I power on my Droid it displays its third eye. It uses that third eye to see into the cloud and transfer data. I can see through the window into the heaven the data that is transferred. You can YouTube the black and white, 1950’s version of “1984” and see that the all seeing eyes on the walls pulsed on and off even back then. The System Administrator on Unix based systems is called root. Root is the username of the one that creates every user (person) in the system (universe) and gives them each a profile (personality). Some users have more than one profile. Root grants access and permissions to the tree of knowledge (file tree) where all the data (knowledge) is stored. Root can disable or delete users. Disabled users have no access to root. Deleted users no longer exist. Virtual systems are software computers that run inside of other computer systems. Virtual systems have their own users but the System Administrator of the host system is the same for all virtual systems. Computer books have whole chapters dedicate to “Becoming Root”. He who has physical access to the system has control of the system. As people, we get to choose our System Administrator, Root of David or root of evil.